Preschool visit to Good Start Lane Cove! It was a fun morning at Good Start Lane Cove. 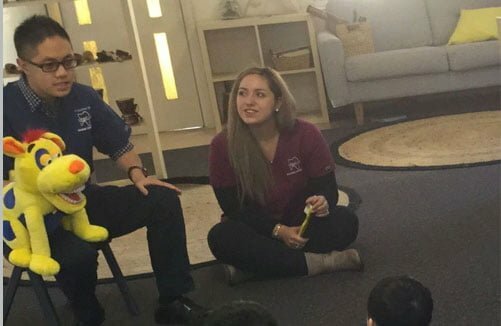 Dr Andrew Ip and our senior dental assistant Ashley had a ball teaching over 30 kids how to look after their teeth and have fun at the same time! Seeing those cheeky grins and smiles brought a smile to everyone’s faces. Within a couple of minutes everyone was making “train wheels” with their toothbrushes and making bubbles with their cheeks! Max the surgery dog certainly had the whitest teeth he has had in ages thanks to the kids of Good Start Lane Cove! We hope everyone enjoyed their goody bags at the end of the day! At Marsfield Dental Care, we take pride in teaching kids young and old how to brush their teeth and look after their gums. It was a truly rewarding experience for everyone involved! If you would like us to visit your preschool please let us know via email (info@marsfielddentalcare.com.au) or suggest it to the preschool staff. It makes for an interesting and educational half day for all of us!